Update: with grid 1.1 you can use /grid spawns to show possible mob spawn locations (always in red, only at night in yellow). Grid 1.2 has a new command /grid circles which shows, well, circles to help you build round towers and similar stuff. Grid 1.3 allows a second parameter to grid spawns to set the light level (for example, mushrooms need light level < 13, use /grid spawns 13 to show those blocks), has a keybinding to show/hide spawn blocks, and fixes the bug where large circles weren't centered on the player. Also, it brings the 1.1 and 1.2 features to forge (for 1.12.2). Sorry, forge 1.13.2 will take a while - as of now, it seems not to have functionality for configuration, and client-side-only commands, so I have to wait for them to complete their port. Grid 1.3a fixes the bug that zero or negative coordinates crash the client. Version 1.3b includes Portuguese translations, thanks to srbedrock. Sometimes you want to place blocks in a regular pattern, so you need to count blocks, and if you mess up once, the error propagates to all subsequent blocks. This mod displays a grid-like overlay over the world, with configurable spacing, so the blocks you're interested in get highlighted automatically. For example, you're building a railroad and want to place a powered rail ever 20th block. Type /grid 20, walk to the first powered rail, type /grid here (or press the c button, can be configured), and the mod will highlight every 20th block from where you're standing. Or, if you want to place torches in an area to prevent spawns, type /grid 5 - this highlights every 5th block; placing torches on each of them will light everything up enough. You can switch between block mode (to highlight blocks to place stuff on) or line mode (to display borders; for example /grid chunks followed by grid lines will turn Grid into a chunk border highlighter), have the y-coordinate of the display floating with the player or fixed, and choose different X and Z spacings if you want that. /grid show and /grid hide: show/hide the grid, bound to the B key. /grid fixy: toggle between floating the y coordinate of the grid with the player, or fixing it to where the player stands when you use the command. Bound to the Y key. /grid circles: shows circle overlays. In line mode, this shows regular circles; in block mode, it tries to find and mark the blocks you should build on to get a circle. Obviously, this can't work well with very small diameters, for example, trying to mark a 3x3 circle will give you a square. /grid distance <n>: sets the range in blocks, that the grid is rendered around you. If you use very large spacings/circle diameters, you need to adjust this too. 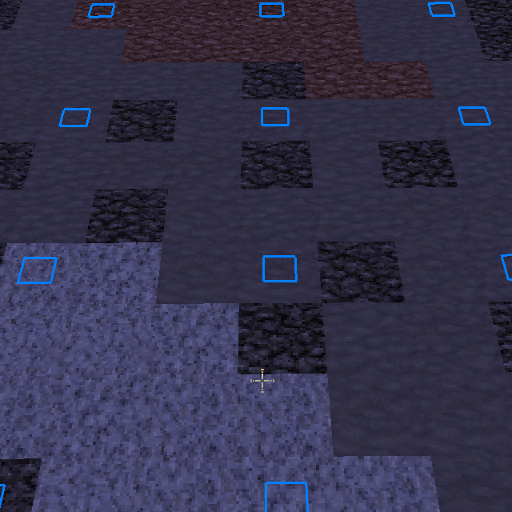 Be careful though, high values for distance absolutely kill your framerate when you turn spawn locations on. All keys can be reconfigured using the standard Controls UI. I really appreciate what this mod brings to 1.13 as a replacement for other light level indicator mods. However, having this mod installed tanks my fps. Without it I can get 100+ fps, but this mod drops it down to below 60 fps. Forge is way from being done or complete on 1.13, for example, it lacks the ability to define your own commands to be locally executed on the client, and it also lacks mixins (which is how the Rift version works around that). So, no, there's no 1.13 Forge version in sight, and with 1.14 being out in a few days, and with Fabric being a modloader that's already working with 1.14, it's unlikely that I'll ever do a 1.13 Forge version. The 1.13.2 version of Rift is at https://github.com/Chocohead/Rift - click the link that says "Using the Minecraft Launcher: the current version can be downloaded here". Double click the jar file that gets downloaded, it will create a config into the launcher for you. In case you're using MultiMC, https://github.com/Chocohead/Rift/issues/7 is your friend. Then just download the mod (the jar file) and put it into the mods folder, like you did with forge. Also, as VoxelMap is working with Rift 1.13.2, several people have made installation tutorials and videos, google for "voxelmap 1.13.2". Those will help you with getting Rift set up even if you're not planning to use Voxelmap itself. Try increasing the grid render distance with /grid distance 300 (use a value that's well above the diameter). Also note that on a server, the distance to your circle might be more than the server's render distance, so maybe you won't see anything from the center. But the circle should render when you get closer to the perimeter. (I just noticed the distance command had no documentation, fixed this). I'm afraid not. The spawns mode is quite the framerate killer anyway, so I decided to limit it somewhat - 2 above and 15 below the player position. It would be very helpful if you could post some example images. Good idea, added some images. I'm confused is the new 1.12.2 Forge version of Grid for 1.13.2 or 1.12.2 (says 1.12.2 in the file name so), since the tag says 1.13.2 for it? I clicked the wrong box when uploading. Fixed that, thanks for pointing it out! It's ok, it happens. :) Your very welcome. Oh yes. That should be caught. I can't get /grid circles to work, no matter what I do it just responds "Parameters not recognized as Integers"
Al those work... but /grid circle, /grid circles, /grid circle 10, /grid circles 10, /grid circles 8 14, nothing works. Which version are you using? Currently, the 1.1 and 1.2 features (show spawn blocks and circles) are in the Rift 1.13.2 version only. Which reminds me I guess I should backport them to 1.12.2 forge as well. I just released version 1.3 for Forge (1.12.2) and Rift (1.13.2), you should get circles to work with those.